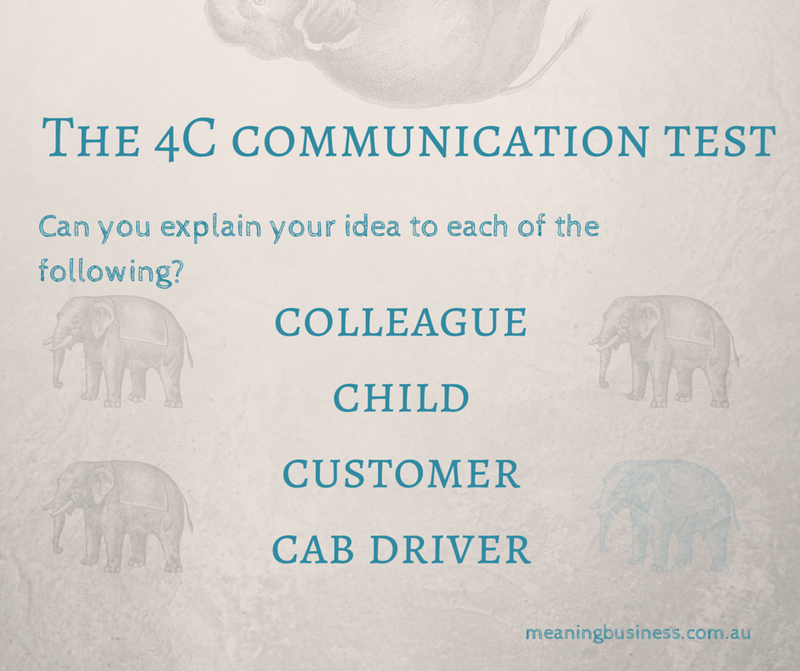 The 4C Communication test ensures that your messages are clear enough to describe the whole to four very different people. A colleague: This tests clarity and depth of understanding. It is the ‘fact check’ version of a message. A colleague will be able to understand the concepts and the detail of the message. Framing your message for a colleague tests for credibility. A child: This forces us to use the most essential elements to create a simple message. Simultaneously conceptual and concrete, the ‘for a child’ test is a challenge of eliminating all but the core. Framing your message for a child tests simplicity. A customer: This message test asks us to focus on the ‘so what’ of a message and to consider the relevance to the ‘other’. How does this help me? Why should I care? Framing your message for a customer tests relevance. A cab driver: Be prepared to explain yourself and to hear a counter-perspective*. Does your message stand up to the scrutiny of a stranger? Framing your message for a cab driver tests for opposition. There are other variations of this. Consider the personas that would be useful tests in your environment. *In no way am I suggesting that cab drivers are essentially argumentative. However, my unscientific sampling spread over many years would indicate that many are conversationalists who have a sense of public opinion, often based on talk radio. Oh love this article Jonathan. There are MANY I need to share this with. Thank you.